However, while Obama’s ratings for dealing with the situation in Afghanistan and the threat of terrorism have improved dramatically – by 16 points and 14 points, respectively, since January – opinions about his handling of the economy have not. Just 40% approve and 55% disapprove of his job performance on the economy, which is little changed from April. Obama gets far more credit from the public than does George W. Bush for bin Laden’s killing. But the military and the CIA and other intelligence agencies receive much more credit – fully 86% say the U.S. military deserves a “great deal” of credit and 66% say the same about the CIA and other intelligence agencies. Roughly a third (35%) say that Obama deserves a great deal of credit for bin Laden’s demise, and a large majority (76%) say he deserves a great deal or “some” credit. 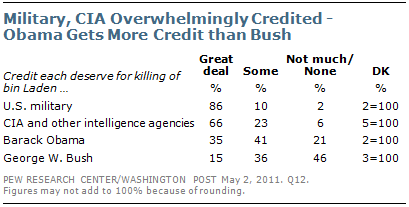 By comparison, 51% say that Bush deserves either a great deal (15%) or some credit (36%) for the death of bin Laden. Since early April, Obama’s job approval rating has risen by 10 points among independents (42% then, 52% now) but is unchanged among Republicans at 16%. Approval among Democrats is relatively steady (85% now, 80% last month). Obama’s job rating has improved more among groups that have been a part of his political base, in particular young people and non-whites. His rating among adults 18 to 39 has climbed 16 points, from 52% to 68%. The change among adults 40 and older has been more modest. Obama also has gained ground among non-whites (up 13 points from 67% to 80%). 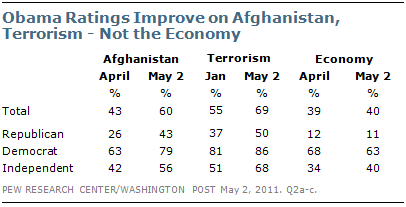 While the killing of Osama bin Laden influenced judgments about Obama’s handling of Afghanistan and terrorism, views of his handling of the economy have not changed. Since last month, Obama’s rating on Afghanistan has risen 17 points among Republicans, 16 points among Democrats and 14 points among independents. The president also made gains in approval of his handling of terrorism among Republicans (from 37% approval in January to 50% now) and independents (from 51% to 68%). On the economy, a majority of Americans (55%) continues to disapprove, with only 40% approving. 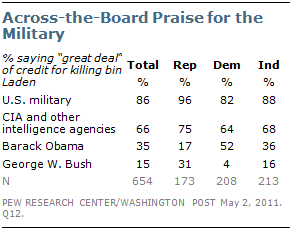 The public has high praise for the U.S. military’s role in the killing of bin Laden, with 86% saying they deserve a great deal of the credit. Two-thirds (66%) also give a great deal of credit to the CIA and other intelligence agencies who tracked the al Qaeda leader and located his hideout. Both the military and the intelligence agencies receive high marks across the political spectrum. Nearly all Republicans (96%), as well as 82% of Democrats and 88% of independents give the military a great deal of credit. Similarly, 75% of Republicans, 64% of Democrats and 68% of independents give the intelligence agencies a great deal of credit. Roughly a third (35%) say Obama deserves a great deal of credit and another 41% saying he deserves “some” credit. Just 21% say he deserves “not much” credit or none at all. About half of Democrats (52%) give Obama a great deal of credit, but only 17% of Republicans do so; 36% of independents give the president a great deal of credit. George W. Bush is given a great deal of credit for the killing of bin Laden by 15% of the public, and an additional 36% given him some credit. Nearly a third of Republicans (31%), 16% of independents and just 4% of Democrats give Bush a great deal of credit. News of bin Laden’s killing by U.S. forces first broke on Sunday evening. Most Americans – 58% overall –say they first heard the news from television, but a substantial proportion of young people first learned of this extraordinary news through social networking. 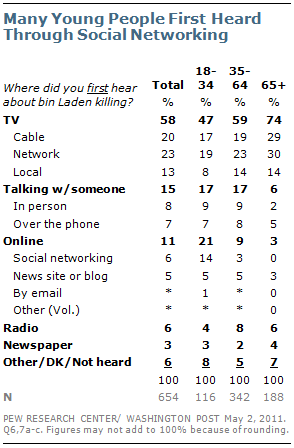 Nearly half (47%) of those under age 35 say they first learned of bin Laden’s death from television; about one-in-five (21%) say they heard the news from the internet – with 14% saying they heard through social networking. Among young people, social networking rivaled network news (19%) and cable news (17%) as the initial source for news about bin Laden’s death. Among older age groups, far more people heard about bin Laden’s death from television; 59% of those 35 to 64 heard the news this way compared with 9% who heard from the internet. Among those 65 and older, 74% first heard from television and just 3% from any online news source.